I thought to myself that I needed to sing to death, perform a rite for death, write death, then bid farewell to it. The way to send death away was to sing with my own death all the death in the sky and on the ground. In essence, to sing to death, she had to allow her own death to take the poetic voice. To let it tell its story. How then are we to hear the songs gathered here? Quite simply, to read this book, is to listen. The shape of a woman appears in the mirror. Now you’ve become toeless feet. Now you’ve become fingerless hands. You’ve become a noseless, mouthless face. Your insides that are so far away yet close, the forest in your hair, light enters the rocky moon, and the sea wavers in your shoes. Birds fly up your sleeves and a horse weeps in your pants. As the forty-nine day passage draws toward a close, faces lose their distinction. Death erases names and identities. “You” lose the ability to recognize yourself or your place in the world. But who exactly is this “you”? 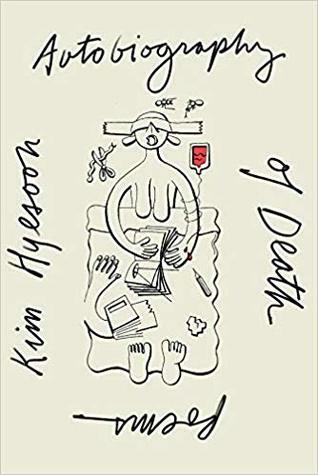 In the conversation with her long time translator, Korean-American poet Don Mee Choi, that closes out the book, Hyesoon explains that she could not call her own death “I”, thus her death became “you”, but not as in a simple second person narrative. It is an intrinsically poetic space, such that “you” was “not I or you or he/she.” She goes on to describe how she began to wonder if the narrator might be a sixth or seventh-person narrator, and the “you” who is being addressed is “my death”—“I” has been killed. This she insists, is in keeping with what she sees as the only way to ethically practice poetry, by practicing the death of “I”. Of course, in reading, “you” also feels like “my” or “our” death. At times, especially with the poems that have a sing-song or nursery rhyme feel, it is not unlikely that one might be inclined to want to sing along. Is it because the restless ocean is clumping up? Autobiography of Death is a collection that leaves one alternately drained and exhilarated. I find it hard to imagine anyone would emerge indifferent. Translator Don Mee Choi’s strong affection and sensitivity for Kim Hyesoon’s poetry is invaluable, while the playfully strange illustrations by the her daughter Fi Jae Lee contribute to the power and magic of this new work from one of Korea’s most important poets. Autobiography of Death is published by New Directions. This sounds amazing and one I will keep an eye out for. It aldo seems to have been thoughtfully translated. The translation of poetry is something I find really intriguing. The interview and translator’s notes that follow the poems really add to the experience. I had not realized until just recently how closely he has worked with her though. This seems like an interesting project, and the language in the quotes you’ve selected is moving and intimate. I like the idea of the images building on each other as the collection unfolds. Much of the imagery is unpleasant, and there is a definite intensity, especially in that final poem. It is a masterful work.